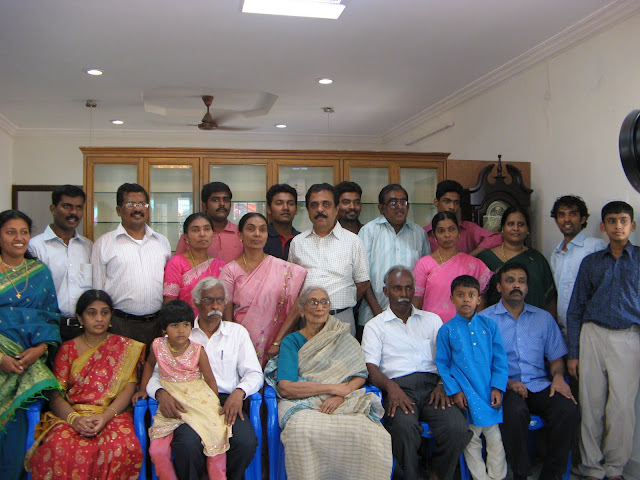 Rev.W.C.David was a presbyter in Tamil Nadu. He practiced what he preached. He is my Grandfather and I have already written my dedication for him here [link]. He went into God's abode in the year 1992. I was a ten year old boy at that time. I still have vivid memories of him carrying the Bible where ever he went. The lady behind him is my Granny, Mrs. Viola David. She breathed her last in the year 2012, 20 years after grand dad passed away. This post is a dedication for my grand mother- a prayerful lady and the greatest ever story teller that I have ever come across in my life. In my college days and then at work, my friends always enjoyed listening to my stories. They always said ," Chriz, you have a talent in weaving a story". I would say, "It is in my genes". My granny had an amazing presentation skill. Her voice modulations, her facial expressions, the manner in which she narrated , built suspense and closed a story are some skills I have never seen in even some of the greatest motivational speakers of our time. Some of her stories are still fresh in my memory. They are as old as 30 years now. But I still have some of the stories narrated by her on cassette tapes. Some of her (and mine) all time favorite stories were Daniel in the Lion's den, David and Goliath, Jacob and Esau, Zacchaeus climbing the tree. My cousins and I would sit around her and she would narrate the stories with an animated face. While she narrated the Daniel in the Lion's den story, she would in deed turn into a lion, growl out loud that would make my cousins and I to shiver. Years later when I watched the movie Mrs. Doubtfire - I happened to see a scene in which Robin Williams would be using Dinosaur models and giving them his voice. That scene reminded me of my grand mom. Today when I tell a story to my 3 year old daughter, I use the same technique my grand mom used. My grand mom lived to the ripe age of 84. One great character that I have seen in her is that she never gossips. No one has ever seen her gossip. When she is in a group where people are gossiping, she would remain silent and she would ask them to change the topic. Many people come to her for counselling and many of them share their deepest and darkest secrets with my grand mom. She has never ever spilled any secret to a third person. This is one great lesson all counselors can learn from my grand mom. When I come across the joke -" If you want to spread a rumor, use the three forms of communication. 1) Telegram 2) Telephone 3) Tell-a-woman", my immediate reaction would always be "Not true in my grand mom's case mate". When she crossed her 80s, she wanted to stay in a old age home, but her children (7 of them) did not allow her to stay in an old age home. She would say "I am a burden to all of you. If I live in an old age home, I would be able to spend time with people of my age". She breathed her last in her last son's home where she lived in the last few years of her life. This photo below was taken in the year 2009. She is sitting right in the middle. All of us have heard her stories. There will never be another story teller like her in my life and I know that for sure because I have been a first hand witness to all her stories. In the days when parents and grand parents are left alone in old age homes, memories like this make me realize how blessed is to have your loved ones close to us when we live in this world. Don't let your parents and grand parents to live their last days in old age homes. That is a beautiful tribute. The grandson also exhibits skills of a great story teller in this wonderful tribute! Nice to see that you enjoy recollecting your grandma as a good story teller. Your children and grand children will admire you in turn. Yes Sir. Thanks so much for going through the post. Appreciate what you do for the elderly.